The relics of this unique work of art and history, the Harwan Buddhist temple is aeons old, and its origin goes as far as 300 AD. 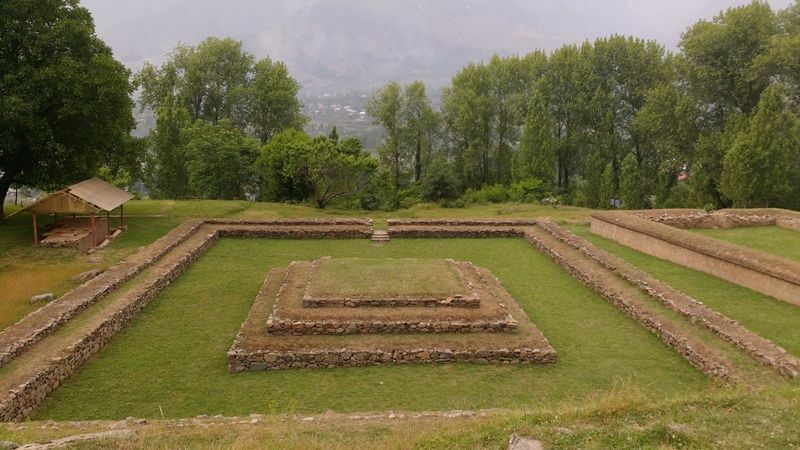 Its ruins are located in Harwan, a village situated in the north-western Kashmir. These ruins are situated towards the northwest of Kashmir and are accessible from the eastern side of Shalimar Mughal Garden. The temple dates back to the Kushan era and civilization. It was discovered during an excavation as part of an archaeological expedition conducted by the Archaeological Department of India approximately between 1919 and 1929 AD. The architecture of this ancient structure depicts the lifestyle, attire and habitat of the people who belonged to that civilization. There are beautiful image carvings on the tiles within the temple. These are mostly the people who look similar to those from Kashgar or Yarkand. Water sources are in form of two springs that probably served the ancient inhabitants. Harwan was earlier known as Shadara Hadwan, that means 'woods of six saints’. This is one of the tourist attractions in Kashmir. It can be reached by rail, road and air. 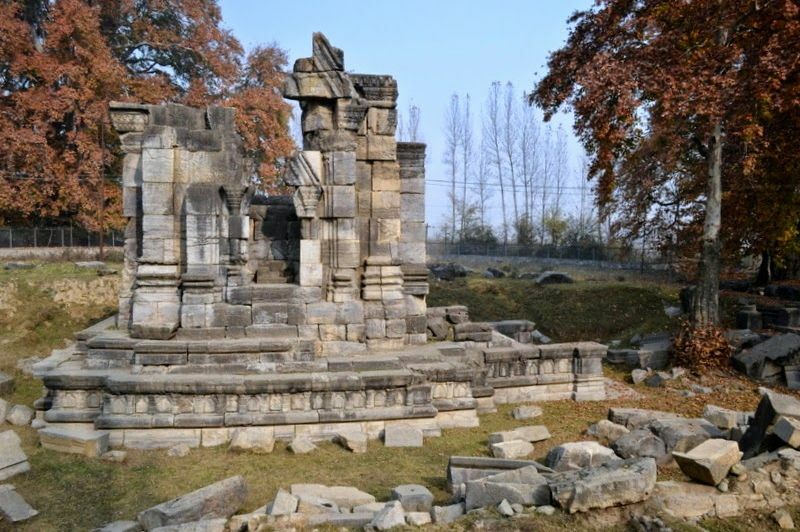 Martand Sun Temple, a spectacular shrine dedicated to Surya (the Sun), lies at a distance of over five miles from Anantnag in the heavenly state of Jammu and Kashmir, India. This structure is a Kashmiri Hindu Temple and is known as one of the most elegant structures ever built in India. Even in a wrecked state, the temple shares it?s story with the ones who genuinely want to listen. The architecture is breathtaking and the vibe somewhat nostalgic but so enticing that it makes travellers want to come here. A walk across the courtyard is a must for visitors to notice the brilliantly fused designs and carvings on the structure that still stand the tests of time and weather. The Martand Sun Temple was constructed between the 7th and the 8th century. Martand, in Sanskrit, is another name for the Sun God in Hinduism. The temple complex was built by Lalitaditya who was the third ruler of the Karkota Dynasty. The structure is constructed of limestone, and the entire complex has been built on top of a plateau near Anantnag. The Government of India has opened the ruined temple complex for tourists, and this site is considered to be of National, Historical and Architectural importance and hence comes under The Archaeological Survey of India. The Temple Complex is so appealing that some legendary projects have featured the location and the mesmerizing ruins. The Bollywood blockbuster movies Aandhi and Haider are some of the projects shot here. When you do visit the site, make it a point to sit without a thought in your mind and relish the tranquillity of the temple in the Gorgeous Kashmir Valley. The Budshah Tomb is an excellent representation of a typical Shahmiri style of architectural brilliance yet to be seen elsewhere in India. The monument or memorial site is seen on the right riverbanks of the River Jhelum, situated quite close to Zaina Kadal in Jammu. During the mid 14th Century, the Muslim dynasty kick started with the arrival of Shah Mir who migrated from Central Asia to India. He was instrumental in establishing this dynasty followed by several successors including Sultan Sikandar. After the demise of Shah Mir, his heir, Sultan Zain-ul-Abidin [1421 AD – 1474 AD], who was known to be an exceptionally peaceful ruler, was deservingly conferred the surname title of ‘Budshah’ or ‘The Great King’. He was known for being spiritually enlightened and highly reputed for the restructuring of the architecture of Kashmir. The Tomb of Sultan Zain-ul-Abidin is quietly placed in the vicinity of Zaina Kadal in Srinagar of Kashmir. 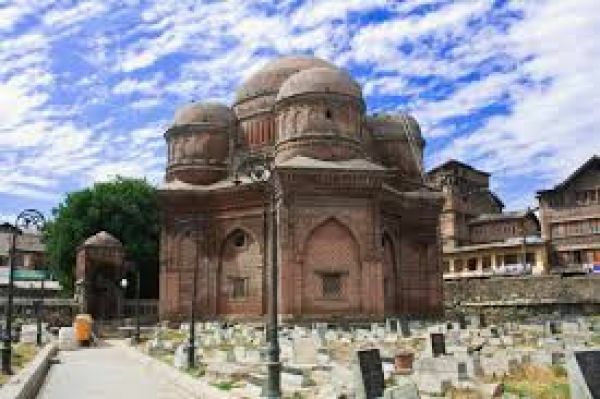 Sultan Zain-ul-Abidin devotedly had the Tomb of his mother, known to all as the Budshah Tomb, erected near the Jhelum water body due to traditional Muslim beliefs and per traditional ceremonies, rites and rituals. Burza Hama ruins reveal the unique cultural and traditional settlements of a bygone era that is considered as the only one of its kind in Kashmir not seen anywhere else in the country and the world alike. Excavations of the remains of the Neolithic civilization were segregated into 4 sections according to archaeologists to signify earthen utensils, bone utensils and related tools, mud settlements, and raw bricks. Amidst these sections of the Burza Hama ruins, the 4th or last segment reveals the existence of an ancient history which dates earlier than the Harwan Buddhist settlement ruins seen in Srinagar. Stone art reveal certain carvings that depicts the Hunting game shooting of the rare Hangul or Kashmir Deer under a Sun to show indicate the time of the day as being an afternoon. The Burza Hama ruins were once an ancient Karewa settlement that dates back to the Neolithic age. 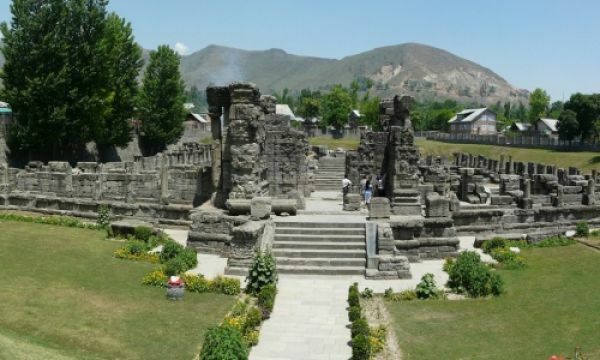 Excavation held at this site in Kashmir was conducted by the Archaeological Department of the Government of India in 1961 revealing a number of relics and artifacts including ancient utensils. They signify the existence of an ancient civilization that has also been preserved well in the National Museum of Kolkata, India. Ancient Palaces and Forts form an integral part of the splendid tourist attractions in Kashmir that captivates everyone who visits them and one such Heritage Site in Jammu is Hari Parbat Fort, an ancient fort whose establishment can be traced back to the period of the Mughal reign in Jammu & Kashmir. Hari Parbat is also referred to as Koh – e – Maran. It is hill that overlooks the city of Srinagar, which also happens to be the summer capital and the largest city of Jammu and Kashmir in India. 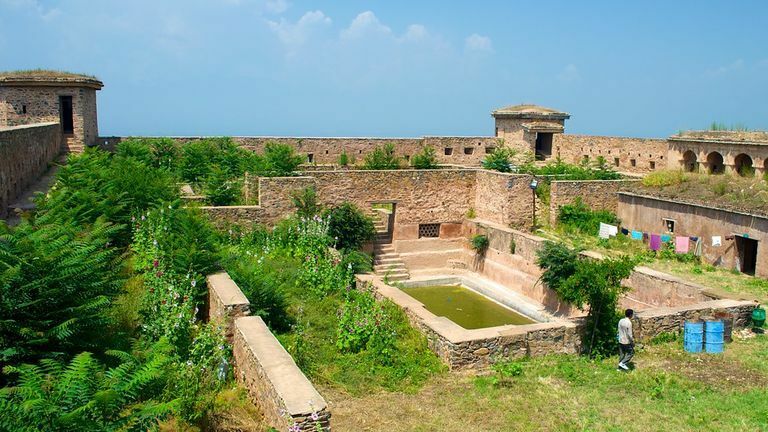 Hari Parbat Fort is the ancient heritage site of a Durrani Fort which was erected in 1808, however; it was in 1590 when its first fortifications were built under the instructions of Mughal Emperor Akbar. The Mughal Emperor had the outer wall of the Fort erected to plan a new capital for his kingdom by the name of Nagar Nagor to be established within the confines of this exterior wall. This project was however left incomplete. The construction work was resumed in 1808 when J&K was under the reign of an Afghan Sultan named Shuja Shah Durrani after whom, the Fort was also named as the Durrani Fort. Hari Parbat Fort is the original fort of the Mughals perched atop the stunning Sharika Hill of Kashmir. It was aptly constructed on the riverbanks of the Dal Lake offering one of the most breathtaking views to cherish thus accentuating the splendid beauty of its surroundings. Hari Parbat Fort is formidably secured on an elevated altitude that commands a panoramic vista of the Dal Lake fringed with Chinar trees and a small Char Chinar island that nestles amidst a lush umbrage gleaming over the lake with luster. The imposing Fort structure is surrounded by almond orchards showcasing a spectacular sight during April when they blossom to the hilt thus announcing the advent of the colourful spring season in Kashmir. The southern end of the outer wall of the Hari Parbat Fort is Gurdwara Chhati Patshahi that commemorates the visit of Guru Har Gobind to Kashmir at Kathi Darwaja in Rainwari, Srinagar. This is a highly revered Sikh Gurudwara in Kashmir and is believed to have been blessed by the visit of the sixth guru of Sikhism who once traveled through Kashmir occasionally preaching. He stopped by this Gurdwara and stayed here for few days before continuing on his journey across lands. Apart from the Gurudwara, there are 2 highly revered Muslim shrines of Khwaja Makhdoom Sahib and Akhund Mullah Shah enshrined on the southern slope within the precincts of this imposing Fort while the sacred shrine of Sheikh Hamza Makhdoom (also referred to as Sultan-Ul-Arifeen and Mehboob-ul-Alam), nestles below the Hari Parbat Fort towards the southern end of Koh – e – Maran Hill. Featuring 2 floors and many pillars, the Muslim Shrine structures display an ancient architecture that appeals to many intrigued tourists. They are largely visited by believers of all faiths, and cultural backgrounds throughout the year making it a highly respected shrine belonging to a Sufi saint, who was also known by the name of Hazrat Sultan. A famous Hindu Shakti Temple lies on the western slopes of the Hari Parbat Fort and is referred to as the Sharika Mata Temple considered highly sacred by the Kashmiri Pundits. A life-size statue of the presiding Deity, Goddess Jagadamba Sharika Bhagwati, who is known to be a form of Durga Mata or Shakti, features 18 arms and is represented by a Swayambhu Shri Chakra or Mahamaha Shri Chakra, collectively named as the Maha Shri Yantra comprising of triangular patterns and mystic circular impressions with a red dot at the center. Three different religious sites within the surroundings of Hari Parbat Fort are a stunner to experience as they symbolize the epitome of secularism in Kashmir and are visited by many followers to pay their tribute to the various religious symbols of India. Nestled between Srinagar and Pahalgam, located on the banks of the river Jhelum, is a small yet historically important town of Awantipura. 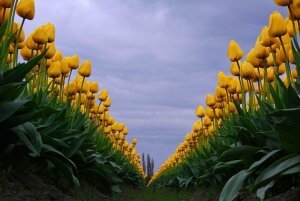 It is situated about 30 kms away from Srinagar, Kashmir. This town is home to the famous Awantipura ruins, representing the once grand Awantipura temple. These charming shrines stand serenely amidst the scenic green valleys and gorges of Pahalgam. 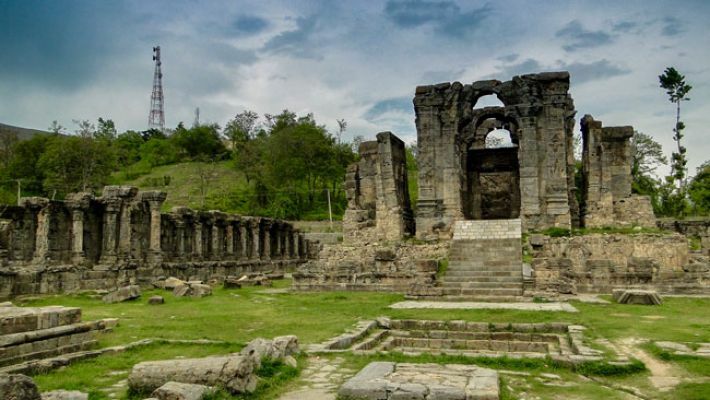 The temple itself was erected by the emperor Avantivarman, during his reign in Jammu and Kashmir (9th century AD). He was a great devotee of Lord Shiva and Lord Vishnu and hence built two major shrines for these deities. In fact, he was the founder of this ancient township. According to traditional trivia, the temple bears the imprints of the aristocratic lineage of Jammu and Kashmir spanning over almost 1100 years. The original layout of the complex shows that the temple was constructed on the central part of an oblong shaped spacious courtyard and four small shrines on each corner. The temple is decorated with beautiful carvings and structures which reveals the masterly architecture and art of that time. Moreover, it has withstood the invasions that the township of Awantipura faced. The Awantipura temple had been intricately designed and it attracts a lot of pilgrims and spiritual folks almost all times of the year. Awantipura has drawn Hindu and Muslim devotees, characteristic of the state which is known for its rich cultural diversity.